For many of us, simply hearing the word interview is enough to send a quick shiver down our spine. There are different kinds of interviews and one of the most popular forms of interviewing is the personal interview. One of the most challenging parts of a personal interview is that there are many kinds of interview questions which might be asked and these might not necessary be theory based. They merely want to evaluate how quick you are able to think on your feet as well as how well you are able to get your ideas across in an effective manner. 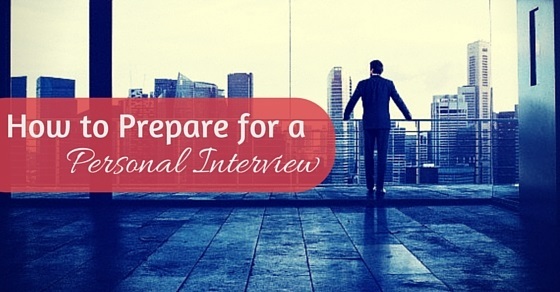 Read on to know how you can effectively handle a personal interview. A personal interview is an interview which is conducted on a one on one basis, where a person who has applied for the job has to meet with the recruiter of the company or the manager. Based on how you are able to communicate, personal interviews can either be the hardest or even the easiest part of the entire hiring procedure. However, what ought to be kept in mind is that you should think a great deal before answering any of the questions which are put forth as taking back your words is most certainly not an option at any point in time. If you happen to say something grammatically incorrect or even inappropriate then that is going to reflect very badly upon your reputation. So do proceed with caution. Strictly speaking, again a personal interview consists of five levels, they are an introduction, probing, recording, closing which is all pertaining to rapport building. One of the biggest merits about having a personal interview is that you do not have to outsmart anyone else rather you can channelize all your energies into ensuring that you do the very best you can. Having to compete with other people might severely affect your own performance thereby having the good opportunity to slip through your fingers. When you are alone you can think in peace and give all your answers in a cool calm and collected manner. A personal interview is no big matter at all, provided you are able to speak very well and are able to put forth your thoughts in a coherent manner. As long as you have all your qualifications as well as theoretical knowledge, this interview will be a piece of cake for you. It is very important indeed that you brush up not merely on your technical knowledge but also on your communication skills. One of the main skills which people look out for in their employees is the ability to get your point across in an effective manner. ‘Do you lead better or prefer to carry out instructions which are given to you’. Though there are a number of benefits to having a personal interview, there are a number of downsides as well. If you are someone who is not very comfortable having the limelight on you at all points in time, then you might not be very comfortable with this form of interviewing. Having a number of people present might put you at ease as there will be others in the hot seat along with you. With a number of people present in the room, competing for all for the same position might bring out your competitive edge and might even cause you to perform better than you ordinarily would. Sometimes being under some pressure will force you to perform better than you might under ordinary circumstances. Another major disadvantage about having this kind of interview is that you will not get much chance to gather your thoughts and collect your ideas, rather you will continuously be asked one question after the next and you must answer without taking on too much of time as it might seem like you are someone who is not very capable of answering on the spot. Mentally prepare yourself for the interview and you will be able to come through with flying colours. Whatever language you choose to speak in ensure that you are fluent in it and do not fumble along the way as that is not going to create a very good impression. What they want to ensure is that you are confident about yourself and that you are passionate about what you do. They want your passion to shine forth through your words so that they know that you will indeed be an invaluable part of the company. It is not important that you make use of big and high sounding words rather just ensure that what you are saying makes sense. If you are confused about how it is that you are expected to sleep then just listening to news anchors talk is very helpful and effective indeed. News anchors speak very well and hardly ever fumble. You too try your best in order to emulate the manner in which such professionals speak. It might not be very easy at first, yet over time you will find that you too will be able to speak in such a bold and appealing manner, causing people to immediately sit up and pay attention to all that you have to say. It is important to remember that your answers should not be very long at the same time you must ensure that your answers are not too short and terse. If you answer in a long drawn out fashion then you are doing nothing but wasting the time of the interviewer. Interviewers are people who are very busy indeed and they do not have the time to hear big stories from you. In addition to this answer, giving very short answers will imply that you are either not very well prepared with your matter or that you have a flippant attitude towards your work. If your body language is not proper then you are sure to not be able to bag the job. Your back should be straight at all times, your legs should be crossed and you should not show or display any signs of nervousness. One of the worst things you can do is sit down without being asked to, enter the chamber without even knocking or not even wishing the interviewer while entering. These little things might not seem very important, yet they go a long way in deciding whether you will get the job or not. They interviewers are skilled professionals and even the smallest of things do catch their eyes. As mentioned above there are some standardized questions which are asked always during the personal interview. So to ensure that you do not end up going completely blank during the interview, remember to sit down in quiet contemplation with yourself and jot down answers to interview questions which are popular and often asked. Answering in an unconventional manner is bound to fetch you a few extra brownie points, but do not take this overboard. It is important that you even memorize your resume so that you do not blank out during the interview. The things which you say are going to reflect the kind of individual which you are. Speaking negatively will imply that you are someone who thinks and basks in negative thoughts and even spreads negativity among people. Companies do not like to hire people who have this negative and pessimistic way of thinking as this negativity does nothing but downs the enthusiasm of the other employees of the company. When the people are positive, this impacts the quality of work which the employees produce and it also ensures that the atmosphere in the office is conducive for work to take place in. A great tip to help you along the way is by practising to speak in front of people. What you can do is ask your family members or friends to spring some personal interview questions on you so that you are in touch with how you ought to be answering on the spot. They might even give you some tips and suggestions of their own, which are bound to help you in the course of the personal interview. These are people who will never lead you astray as they genuinely want what’s best for you at all costs. So do make it a point to listen to what they have to say, as they do have your best interest at heart. One of the biggest mistakes to make is arriving late on the spot. If you do something like this, not only are you showing that you do not have any sense of responsibility, in addition to this, while reaching you will certainly not be in a mental position to answer the questions which will be put forth to you. It is only when you are cool calm and collected that you will be able to perform to your full potential, so you must ensure that you take the pains to leave for the interview with enough time at your disposal. Reaching before the stipulated time is bound to work in your favor and show how responsible you are. The clothes which you wear will reflect your own personality and it is advisable that you dress professionally for interview without going over the top and looking like you have come for a party of some kind. Even your papers and documents should be organized in a proper manner and placed in a neat file such that you show that you are someone with tremendous organizational skills. Hopefully, the above tips for an interview is bound to help you to crack a personal interview. Going for an interview like this is merely a mind over matter situation, where if you are confident and hold your head up high you are bound to make a good as well as lasting impression upon the person who is taking your interview. Make sure that you take your time in order to answer all that is asked of you to the best of your ability. A personal interview is a very important phase of the interview, if you answer in a proper manner then there is no reason why you will not be able to bag the job.